Attleboro, 70 @ Taunton, 45 – Final – Attleboro’s offense was clicking on Friday night, shooting over 60% from the field in a win over the Tigers. With the win, Attleboro qualifies for the state tournament. The Bombardiers were 29-for-48 from the field, including eight three-pointers. Sophomore Bryant Ciccio had a career-high 24 points along with seven assists, Kevin Velazquez and senior Nate Douglas each added 13 points apiece and sophomore Qualeem Charles had six points and 13 rebounds. Stoughton, 56 @ Canton, 65 – Final – Canton added to its lead after each of the first three quarters to beat Stoughton and clinch a share of the Davenport division title, the program’s first Hock title since 1992. The Bulldogs led 11-8 after one, 32-26 at halftime and 47-37 heading into the fourth. Senior Jake Verille scored a career-high 20 points while classmate Austin Maffie poured in 20 points and hauled in 10 rebounds to pace Canton. Colin Sanda had 15 points and four assists for the Black Knights. King Philip, 49 @ Franklin, 62 – Final – Franklin pulled away in the fourth quarter to hold off an upset attempt from King Philip. The Panthers led 36-35 going into the final period and scored 26 points to secure the win. Senior Paul Mahon paced Franklin with 21 points while junior Jalen Samuels added 17 points. Milford, 72 @ Sharon, 55 – Final – Milford scored 45 points in the first half, running away with a win over a division foe on the road. Junior Brendan White scored a game-high 24 points, Andrew Fraioli (12 points, 10 rebounds) and Kayden Kelley (10 points, 12 rebounds) both recorded double-doubles and Zach Tammaro chipped in with 13 points. Sharon senior Malik Lorquet scored a team-high 20 points for the Eagles. Taunton, 42 @ Attleboro, 43 – Final – Jordyn Lako hit a go-ahead free throw with eight seconds left and Liv McCall sealed the win with a steal three seconds later. Sam Pierce scored 14 points to lead the Bombardiers, while Nyah Thomas added eight. Hannah Moniz was Taunton’s top scorer with 10 points. Canton, 48 @ Stoughton, 49 – Final – Click here for a Recap and Photo Gallery from this game. Foxboro, 66 @ North Attleboro, 41 – Final – Lily Sykes scored a team-high 23 points for the Warriors, who capped off the program’s first perfect season in the Hockomock League. Oliver Ames, 49 @ Mansfield, 42 – Final – Oliver Ames pulled away late, breaking open a 34-34 game by going 5-for-5 from the line and scoring off its defense down the stretch to earn a split of the season series with the Hornets. Abby Reardon and Caroline Flynn each came up with key free throws during that stretch. Kayla Raymond led the way for the Tigers with 14 points and Erin Holmberg added 11. Maggie Danehy had 13 and Mady Bendanillo had 10 for Mansfield. Sharon, 55 @ Milford, 62 – Final – Emily Piergustavo celebrated senior night with a career-high in points and a triple-double to help the Hawks close out the regular season with a win. Piergustavo scored 27 points, pulled down 10 rebounds and dished out 10 assists. Julie Rabinowitz scored 14 for Milford, knocking down four three-pointers. Emma Eberhardt was Sharon’s top scorer with 27 points, while Telishya Herbert had 15 and Kaitlyn Wallace has 11. North Attleboro, 55 @ Attleboro, 52 – Final – Trailing by five in the fourth quarter, North Attleboro junior Nate Gonsalves drained a three to spark an 11-2 run for Big Red. Gonsalves then converted a layup with just over a minute to play, giving the Rocketeers a 51-50 lead. Ethan Friberg and Evan Rosenberg also scored in the run, and Josh Montague scored with just under a minute to play to make it 53-50. Attleboro’s Qualeem Charles and Montague traded two free throws apiece but the Bombardiers’ three-point attempt at the buzzer was just long. North Attleboro had nine players make the score sheet, led by Montague’s 16. Derek Shanks had a career-high 11 points while Gonsalves finished with eight. Dom Victor led Attleboro with 16 points, Charles added 10 points and sophomore Bryant Ciccio chipped in with nine points. Canton, 46 @ Franklin, 74 – Final – Franklin raced out to a 17-6 lead at the end of the first quarter and built a 33-16 lead heading into the break in a big win over Canton. The Panthers extended the lead to 57-36 after three quarters. Junior Jalen Samuels and sophomore Chris Edgehill each scored 22 points in the win for the Panthers. Foxboro, 45 @ Taunton, 55 – Final – The Tigers extended their lead in each of the first three quarters and held off Foxboro’s late push to finish a win. Taunton led 13-7 after one, and then by 11 following the second (28-17) and third quarters (44-33). Foxboro cut the deficit to five in the fourth quarter (50-45) but the Tigers slammed the door shut. Senior Lens Esquil had a team-high 18 points while classmate Malik Charles added 10 points for the Tigers. Senior Joe Morrison netted a game-high 20 points for Foxboro while sophomore Brandon Borde chipped in with 10 points. Stoughton, 60 @ King Philip, 55 – Final – Click here for a recap of this game. Sharon, 53 @ Mansfield, 81 – Final – Sharon cut the deficit to seven early in the second quarter but Mansfield rattled off a 16-4 run to close the half, creating a double-digit lead it never surrendered. Mansfield senior John McCoy had a team-high 21 points while Sam Hyland had a terrific all-around game with a career-high 16 points, nine assists, seven rebounds and two steals. Sharon senior Malik Lorquet had a team-high 18 points and 14 rebounds while Jimmy Fitzhenry added 12 points. Milford, 36 @ Oliver Ames, 55 – Final – Oliver Ames held Milford to eight points in the first, and nine in the second before building a double-digit advantage in the second half. OA senior Jack Spillane scored a game-high 20 points to lead the Tigers while Ethan Eckstrom and Matt Muir each chipped in with nine points. Milford senior Andrew Fraioli had 13 points and 15 rebounds for the Scarlet Hawks. Attleboro, 50 @ North Attleboro, 49 – Final – Sam Pierce knocked down the game-winning free throw with eight seconds remaining. The senior forward finished with 18 points and 10 rebounds in the win. Nyah Thomas also had a double-double for the Bombardiers with 11 points, 11 boards, and five steals. North got 13 points from Julia Santos and 12 points from Julia Feid. 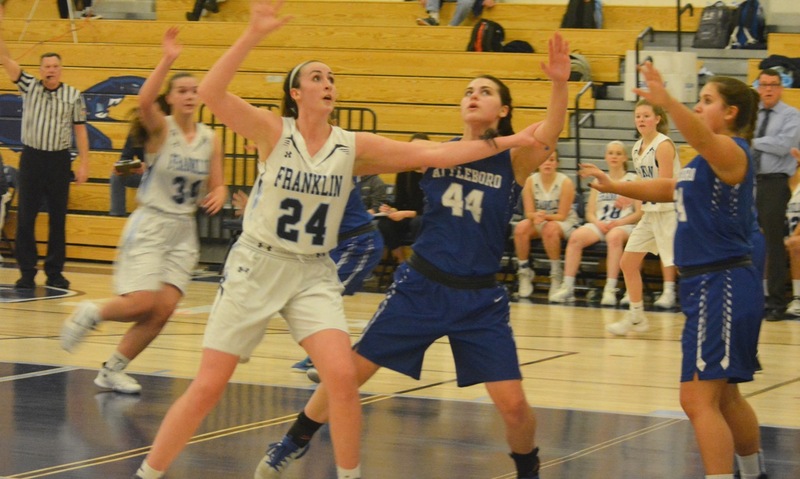 Franklin, 52 @ Canton, 26 – Final Franklin had seven players score at least five points in the game and put in what head coach John Leighton called the “best defensive effort” of the season by holding Canton to four points in the first half. Megan O’Connell was the top scorer for the Panthers with 12 points, while Breanna Atwood added nine and Ali Brigham had eight. Taunton, 27 @ Foxboro, 85 – Final – Click here for a Recap and Photo Gallery from this game. King Philip @ Stoughton – Postponed to a date and time to be announced. Mansfield, 55 @ Sharon, 27 – Final – Meg Hill scored 21 points to lead the Kelley-Rex leading Hornets to a road win. Ann Maher added nine for Mansfield. Evanjuline Elisma and Telishya Herbert each scored nine points for the Eagles. Oliver Ames, 60 @ Milford, 45 – Final – Oliver Ames built a 19-point lead at halftime that was cut down to 11 heading into the final frame, and down to nine with under four minutes to play, but the Tigers finished with an 9-3 run to close the game. Kayla Raymond paced the Tigers with 20 points and 14 rebounds while Alex Sheldon notched a career-high 16 points. Senior Abby Reardon added 10 points and seven assists for the Tigers. Milford’s Kate Irwin had 16 points. Taunton, 24 @ Josiah Quincy Upper School, 54 – Final – Taunton picked up wins from Josh Grasso (132), Guerard Theodore (145), Tyler Kennedy (160), Candido Santos, and Woudanly Danger (220). Taunton, 47 @ Attleboro, 57 – Final – Click here for a recap of this game. Canton, 66 @ Stoughton, 40 – Final – Canton turned a four-point lead at halftime into a big win with a huge second half. The Bulldogs led 30-26 at half, and then 51-38 after three quarters. Canton slammed the door shut with a 15-2 final quarter. Austin Maffie led the Dogs with 20 points while Devin Foster added 19 points in the win. Cam Andrews led the Black Knights with 20 points. Foxboro, 50 @ North Attleboro, 48 – Final – North Attleboro had a lead at the end of each the first, second and third quarters but Foxboro’s offense came to life with 21 points in the final frame, edging Big Red in the final minute. Joe Morrison scored eight of his game-high 15 points in the final frame, including a pair of threes, to help the Warriors earn the win. In the final minute, Devin Hassett scored on a broken play just before the shot clock to put Foxboro up 50-48. Sophomore Brandon Borde added 10 points while Hassett had all nine of his points in the second half. Josh Montague led North with nine points while Nate Goncalves and Chad Peterson each had eight points. Franklin, 61 @ King Philip, 44 – Final – Franklin turned a six-point lead at halftime into a 19-point lead (49-30) heading into the final quarter and never looked back. Sophomore Chris Edgehill led the Panthers with 22 points while junior Jalen Samuels added 14 points. Oliver Ames, 39 @ Mansfield, 72 – Final – Mansfield limited Oliver Ames to five points in the first quarter, and then six in the second to build a 39-11 lead at the break. Junior Tommy Dooling connected on five three-pointers for a career-high 15 points to lead the Hornets. Tyler Boulter added 11 points and John McCoy had 10 points and eight rebounds. Sharon, 59 @ Milford, 77 – Final – Milford poured in 49 points in the first half, building a 30-point lead that it never surrendered. Sharon got within 12 in the second half but the Scarlet Hawks never allowed it to get to single digits. Brendan White led Milford with 20 points while senior Kayden Kelley had 13 points and 14 rebounds, Brendon Sailer added 11 points and Andrew Fraioli finished with eight points and five rebounds. Sharon’s Malik Lorquet and Lester High each scored 13 points. Attleboro, 40 @ Taunton, 51 – Final – The Tigers went on a 14-3 run to close the game after the teams entered the fourth quarter tied 37-37. MacKenzie Handrahan paced Taunton with 13 points and 12 rebounds, while Alexa and Kelsey White each added 12 points. Lily Patneaude had a solid all-around game with six points, six assists, and six steals. Sam Pierce was Attleboro’s top scorer with 15 points. Stoughton, 56 @ Canton, 40 – Final – The Knights were led by sophomore guard Aliyah Wright, who led the team in scoring with 22 points. Senior forward Val Whalen chipped in with 12 points for Stoughton. North Attleboro, 26 @ Foxboro, 75 – Final – Ashley Sampson had another big night for the Warriors with 26 points, while Lily Sykes added 17 and Katelyn Mollica had 16. King Philip, 47 @ Franklin, 56 – Final – Ali Brigham led the way for the Panthers with her second 20-point game of the week. The sophomore center scored 23 points and recorded her second triple-double of the season. Mansfield, 44 @ Oliver Ames, 31 – Final – Click here for a Recap and Photo Gallery from this game. Burlington Quad (Oliver Ames) – A shorthanded Oliver Ames squad picked up a pair of wins on the day. The Tigers were narrowly edged by Arlington (34-32) but had impressive showings against Burlington (45-31) and Mascononmet (42-39), Cobey Williamson, Anthony Berksza and Dean Pacini all went 3-0 while Darnele Ryan (220) went 2-1.